Mecklenburg-Vorpommern (also known as Mecklenburg-Western Pomerania in English) is a federal state in northern Germany. The capital city is Schwerin. The state was formed through the merger of the historic regions of Mecklenburg and Vorpommern after World War II, dissolved in 1952 and recreated prior to the German reunification in 1990. Mecklenburg-Vorpommern is the sixth largest German state by territory, and the least densely populated one. The coastline of the Baltic Sea, including islands such as Rügen and Usedom, as well as the Mecklenburg Lake District are characterised by many holiday resorts and pristine nature, making Mecklenburg-Vorpommern one of Germany's leading tourist destinations. Three of Germany's fourteen national parks are in Mecklenburg-Vorpommern, in addition to several hundred nature conservation areas. 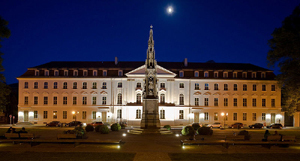 The University of Rostock (est. 1419) and the University of Greifswald (est. 1456) are amongst the oldest in Europe. 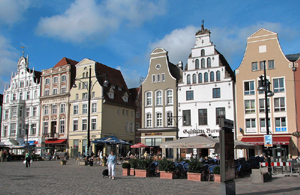 Major cities include Rostock, Schwerin, Neubrandenburg, Stralsund, Greifswald and Wismar. Mecklenburg-Vorpommern was the site of the 33rd G8 summit in 2007. 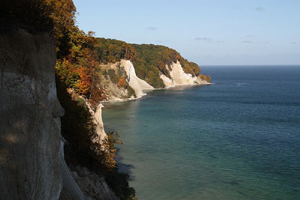 This area is picturesque with its 210 miles of coastline with numerous inlets surrounded by steep cliffs, beaches and several Islands - Usedom, Hiddensee, and Rügen with elevations up to 525 feet. Fifteen percent of this land is made up of natural reserves making it uniquely diverse. The wonderful moderate climate offers clear, salty air, soft breezes and many hours of sunshine to pamper visitors searching for true rest and relaxation. 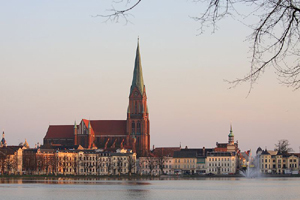 Schwerin-Pomerania's western capital city of Schwerin dates back to 1018 with its Schwerin Cathedral, regarded as one of the best known examples of Gothic brick architecture in Baltic Sea region. The castle and museum with surrounding gardens are lovely. A rich wealth of water and woodland, cultural treasures rich in tradition and fascinating architecture give the State capital of Mecklenburg-Western Pomerania, the second oldest city east of the Elbe, its character. Schwerin is surrounded by many picturesque lakes. The largest of these lakes, the Schweriner See, has an area of 60 km². In the midst of these lakes there was once an Obotrite settlement (dated back to the 11th century). The area was called Zuarin, and the name Schwerin is derived from that designation. In 1160, Henry the Lion defeated the Obotrites and captured Schwerin. The town was subsequently expanded into a powerful regional centre. A castle was built, and expanded upon over the centuries, on this site. It is supposedly haunted by the small, impious ghost, called Petermännchen. 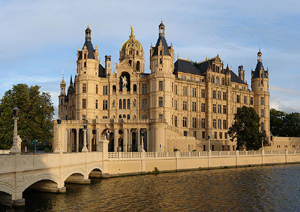 The great attraction of the state capital is Schwerin Castle. The city's emblem is set in a picturesque location on the banks of Schwerin Lake, Germany's third largest lake. Rügen, Germany's largest and possibly most beautiful island, has offered vacationers and bathers a perfect paradise for over a hundred years. Several seaside resorts offer tourists spa resorts, fishing villages, breath taking white sandy beaches as well as hiking and biking trails which lead into practically untouched natural environment. Rügen is a Kreis (district) in the northeastern part of Mecklenburg-Vorpommern, Germany. It is bordered entirely by the Baltic Sea. The nearest district is Nordvorpommern and the district-free city Stralsund. The district covers the islands Rügen and Hiddensee, and several small islands like Ummanz and Vilm. It is thus the only district of Germany which consists solely of islands. Bergen auf Rügen is the capital of the district of Rügen in the middle of the island of Rügen in Mecklenburg-Vorpommern, Germany. Since 1 January 2005, Bergen has moreover been the administrative seat of the Amt of Bergen auf Rügen, which with a population of over 23,000 is Mecklenburg-Vorpommern's most populous Amt. Rostock ( literally "flowing apart") is the largest city in the north German state Mecklenburg-Vorpommern. Rostock is located on the Warnow river; the quarter of Warnemünde 12 km north of the city centre lies directly on the coast of the Baltic Sea. In Rostock's long history, the city carried three different coat of arms known as the Signum, Secretum and Sigillum. The Signum, which can be traced back to 1367, was developed last and is to this modern day the coat of arms of the city. Greifswald , officially, the University and Hanseatic City of Greifswald is a town in northeastern Germany. It is situated in the state of Mecklenburg-Vorpommern, at an equal distance of about 250 kilometres (160 mi) from Germany's two largest cities, Berlin and Hamburg. The town borders the Baltic Sea, and is crossed by a small river, the Ryck. It is also located near Germany's two largest islands, Rügen and Usedom as well as near three of the country's 14 national parks. The population is about 55,000, including 12,500 students and 5,000 employees of the University of Greifswald. Greifswald is internationally known due to the university and nearly one in three people in Greifswald are linked in some way to higher education. Neubrandenburg is a city in Mecklenburg-Vorpommern, Germany. It is situated in the southeastern part of the state, on the shore of a lake called the Tollensesee (18 km²). The city is famous for its rich medieval heritage of Brick Gothic. It belongs to the famous European Route of Brick Gothic, a route which leads through seven countries along the Baltic Sea coast. 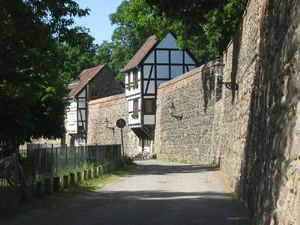 Neubrandenburg has preserved its medieval city wall in its entirety. The wall, 7 m high and with a perimeter of 2.3 km has four Brick Gothic town gates, dating back to the 14th and 15th centuries. During World War II, a large prisoner-of-war camp Stalag II-A was located close to the town. In 1945, few days before the end of World War II, 80% of the old town was burned down by the Red Army in a great fire. In that course, about 600 people committed suicide. Since then, most buildings of historical relevance have been rebuilt.